This hunter's style German quartz cuckoo clock features wooden hands, a wood dial with Roman numerals, and a warm light yellow hand-painted and hand-carved cuckoo bird. 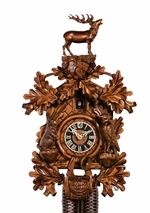 The cuckoo clock case features hand-carved oak leaves, a bunny, a bird, and a buck at the peak of the roof with two crossed rifles beneath him. Two cast iron pine cone weights are suspended beneath the clock case by two seperate brass chains. The hand-carved pendulum continously swings back and forth. On every hour the cuckoo bird emerges from a swinging door above the clock dial and counts the hour by cuckooing once per hour. (Example: At one o'clock the bird will cuckoo once. At eight o'clock the bird will cuckoo eight times) The half hour is announced with one cuckoo call. *Great effort has been made to portray each cuckoo clock as accurately as possible. As with many handmade items, the exact coloration and carving may vary slightly from clock to clock. We consider this to be a special part of their character. This clock is covered by a two year limited warranty covering workmanship and manufacturers defects. Item Weight - 4.25 lbs.